The Ring of Kerry is one of the most scenic driving routes in the world, and if you want to enjoy amazing views of natural wonders and stop by castles, chapels, charming villages, and parks, there is hardly a more convenient way to do it. The 180 km circular road is easy to follow, and the wide range of sights and landmarks can easily fill a day or two. With dozens of tour buses making the ritual loop around the ring on a daily basis, most blogs recommended driving counterclockwise to escape the tour-bus procession. But we decided to leave the hotel early and work our way clockwise. I’ve recapped where we stayed, where we ate, and what we did during our brief time in this beautiful county. I can’t wait to visit again! Out of all the towns I visited in Ireland, Killarney was my favourite. We arrived the previous night after a 4 hour drive from Dublin and we spent the night at the newly renovated Heights Hotel in Killarney. In the morning we opted to walk around town and started the day with breakfast at Café du Parc. We went to Killarney National Park, and a great way to see the expansive and scenic land. Killarney Lakes and National Park are probably the main attractions that bring visitors to Kerry. Depending on the season, Killarney offers an abundance of walking and hiking opportunities. Hiring a boat for a tour on the lakes is a charming way to explore the beauty of the place. If you want to have a good perspective of the mystical landscape of Kerry, some of the highlights are: the magnificent Ross Castle on the shore of Lough Leane (one of the lakes of Killarney). The castle was built by O’Donoghue Mór in the 15th century. The Castle came into the hands of the Brownes who became the Earls of Kenmare and owned an extensive portion of the lands that are now part of Killarney National Park. Tours of the castle are available for €5 per adult (price in March 2019). No videos or photographs are allowed inside the castle. Across the road lies Torc Mountain where Torc Waterfall a 20 metres high, 110 metres long cascade waterfall formed by the Owengarriff River as it drains from the Devil’s Punchbowl corrie lake at Mangerton Mountain. The waterfall is a 200 metres (uphill) from the car park, I’d advise wearing comfortable shoes and bringing a water bottle. A stroll or tea at Muckross House, a Victorian mansion where Queen Victoria spent three nights in 1861. Adjacent to Muckross House is a fascinating open-air folk museum that covers Irish Farm life from the 1920s to the 1950s. The entire area is suffused with cultural and historical sights, which adds more qualities to the impressive nature. From Killarney town centre, visitors can take a hop-on-hop-off tour bus to explore various areas of the Killarney National Park. Around the lakes, there are many top class golf courses, and visitors find here everything they need for a pleasant stay, from accommodation to restaurants. If you don’t feel up for walking when visiting Killarney National Park, you can hire a horse-drawn carriage (jaunting car) so you can explore the area in a more relaxed manner. While driving through Kenmare, stop at The Meeting of Waters where The Upper lake, Middle Lake (also known as Muckross Lake) and Lower Lake (Lough Leane) converge. Situated on a lake, The Lake Hotel Killarney is only minutes away from Killarney Park, and the picturesque location will make your stay memorable. The hotel has a great restaurant and a beautiful lounge & bar area. A full-service spa can be found onsite as well. The 131 rooms are gorgeously decorated and guests will notice many thoughtful touches aimed at their ultimate comfort. Located on a private estate at the edge of Killarney’s National Park, this beautiful boutique hotel was built in 1877 and has a long history of success. The manor home is surrounded by lush greenery and offers 12 charming rooms with original features. The remaining 24 rooms in the other wing of the hotel are also beautifully decorated. A four-star hotel right in Killarney town centre, the Fairview Hotel is perfectly located if you want to be near the train station or near the main shopping district. Regular rooms feature hardwood floors and stylish touches while the upgraded rooms may feature a fireplace or a 4-poster bed. The restaurant’s menu is excellent, and the lounge area includes a cosy fireplace. The drive to Sneem was filled with a scenic mountainous chunk of Killarney National Park (great views at Molly’s Gap). We arrived in the picturesque village of Sneem and went through a serene walkway down the banks of the Sneem river is the location for The Garden of the Senses. The gardens, while small, are awash with flowers and trees, a picnic and barbecue area. We bought a cone of ice cream and enjoyed it while we sat in the Sculpture Park. The small coastal village located between the Atlantic Ocean and Lough Currane is known for its game angling and its 18 hole championship golf links, Waterville is also a paradise for the hill walker, cyclist, pony trekker, ornithologist, astronomer, archaeologist, fishermen, water sport enthusiast. With so much to do in Waterville, visit the Sea Synergy Marine Awareness Centre and discover Ireland’s Marine Life or attend a workshop. Stop at the St. Michael’s Church and Visitor’s Centre to find out about Waterville’s rich history. 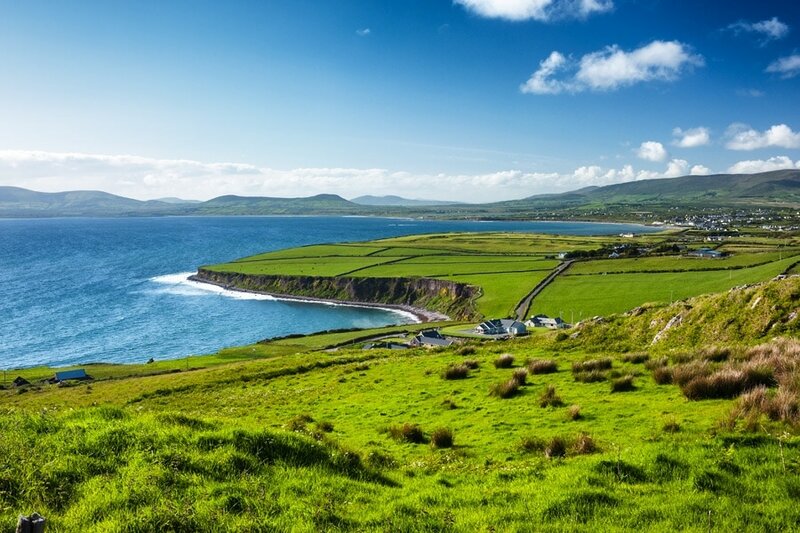 For the most stunning view on the Ring of Kerry, Head to Portmagee where you will turn off at the signs alerting you to “Kerry’s most spectacular cliffs.” For €4 per person (price in March 2019), you can see these cliffs that were formed over 400 million years ago at the most westerly point of the headland where once stood two stone build forts, today all that survives is a stone wall a few feet high is with sheer 60ft cliffs behind them and acres of wild wind blow bog land in front. Access to Valentia Island is via a bridge from Portmagee. The bridge is called the Maurice O’Neill Memorial Bridge. It was built in 1970 and named in memory of a young farmer captured and judged by a military court before being executed in 1942. After you cross the bridge you will see the The Skellig Experience Centre on the left hand side where visitors can learn about the history of the monks on the Skellig Islands. A visit here is highly recommended. We opted to spend the night at Cul Cottage, a 200 year old Irish Cottage that overlooks Dingle Bay and the Blasket Islands. It has been restored to maintain its old world charm and echoes memories of years gone by. This cosy cottage with open turf fire and original settle seating is available to rent throughout the year. Inclusive of all the mod cons, it comprises of two bedrooms, sleeping four. We left our cottage and went to see the ruin of what was once a 15th century castle of MacCarty Mor. A few hundred meters on from Ballycarbery Castle is Cahergall Stone Fort, The 2,000-year-old walls of Ireland’s Leacanabuaile Ring Fort have withstood the test of time – without the aid of mortar or cement. Stone forts are believed to have served as protection for farmsteads. Visitors can walk up the stone stairways inside Cahergall Stone Fort to access the top of the structure. It was reconstructed and is in very good shape. Access is free. Tralee is the county town of Kerry and is a great introduction to the area’s massive touristic potential. The city boasts beautiful historic buildings and many great hotels, restaurants, and pubs. A visit to the Kerry County Museum will take you through thousands of years in the history of Kerry and Ireland. A show at Siamsa Tire, the National Folk Theatre of Ireland, is also a unique experience which you can only have here. The town is known for the Rose of Tralee International Festival so you could plan your visit around it.If your budget allows it, Ballyseede Castle Hotel could be the most authentic and romantic place to stay in Kerry. Set in a 16th-century castle, with 30 acres of forest and lawns, the hotel is located a few kilometres away from Tralee town. The rooms have individual, classy designs with plenty of amenities. The hotel also includes a library bar and a chandelier-lit restaurant, besides several elegant lounges. Carrauntoohil is Ireland’s highest mountain and since it is located in Kerry, it is the best place for some spectacular views of the county and the surrounding areas. While a hiking trip to the top is more for the experienced rather than amateurs, there are local guides who organize daily trekking tours. At the top of Carrauntoohil, a fascinating view opens up over other glacial peaks, revealing the unique geology of Kerry. Even if you won’t have time to reach the top, a short hiking trip can take you through gorgeous woodlands and you will still get a chance to see fog-shrouded mountains, beautiful ridges and peaks, and pass by glacial lakes or old Celtic ruins. We wanted to visit Skellig Michael, but unfortunately the tours operate from May – October and their weather dependent. Skellig Michael or Great Skellig is an island in the Atlantic, part of County Kerry. The otherworldly scenery of the island and the range of natural wonders are an excellent reason to visit it. An abandoned Christian stone monastery from the 6th to 8th –century adds to the charm of the place, but Skellig Michael has plenty of other historical sites and it is a UNESCO World Heritage Site. From April to August, the island is inhabited by thousands of Atlantic Puffins so if you plan your visit then, you can see the world’s cutest birds in their natural habitat. This is a one-of-a-kind Experience and definitely something you should do in ireland!